Mel Brooks didn't know what he started when he created the Broadway and Hollywood hit musical and movie The Producers. Late night TV host Jimmy Kimmel has taken the show and created a hilarious parody, tying it to the Republican primary contest that's playing on our TV screens every day and night. 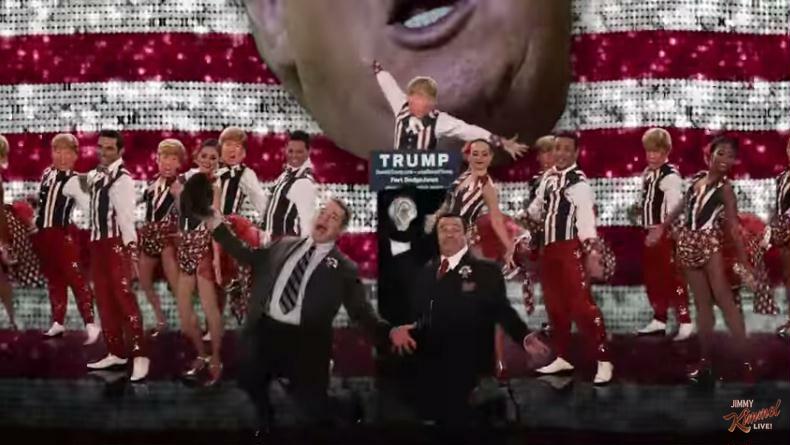 Of course the bigger than life center of the parody is presidential candidate Donald Trump. Whether you're for him or against him, you should find the satire very funny. As we said when we posted the Bernie Sanders bad lip reading video last week, Jewish Humor Central generally avoids political humor, but this one was just too funny to resist. Like the original musical, this parody includes a few choice Yiddish words. The Producers stars Matthew Broderick and Nathan Lane reunited for Jimmy Kimmel's post-Oscars special to appear in a trailer for a faux-sequel to their hit musical. "Just in time for the election, it's a story that starts off funny then gets really, really depressing," the trailer warns of Trumped, which finds the two producers hopping aboard the runaway train known as Donald Trump. "Max, do you realize that under the right circumstances it might be possible for us to make more money from a losing candidate than from a winner? First we find a bad candidate, then we raise money like crazy and we promise all the donors an ambassadorship, to Italy or Sweden or Armenia," Broderick's Bloom proposes, planting the seed of the Trump campaign. Too funny but also too scary!